There are a lot of four wheeling options for off roading in Montana. First, just outside of Missoula, a 4×4 trail up in Blue Mountains offers a track that ends at Telephone Butte. The trail is easy and can be accessed by a Jeep or 4×4 truck. On the return trip back, the views of the Missoula, and Bitterroot valleys are impressive. The first part takes a graded dirt road to Woodsman Saddle, followed by a challenging trail with mud holes to the completion of the track. Another option is Rock Creek; it is a bit east of Missoula off of County Road 348. 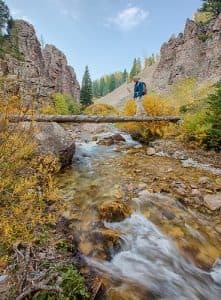 This trail offers a chance to fish, and is advertised as one of the best Blue Ribbon trout streams in Montana. At the start, the trail is paved for 60 miles, but then a graded dirt road follows along the creek. Pay close attention since there is a strong possibility that you will run into variety of wildlife including a big horn sheep, moose, or deer. Ultimately, if you continue on Rock Creek Road, there are two choices to make. One, turn east towards Philipsburg, and then back home along Montana’s scenic highway 1. Or two, continue to drive straight to the south, which will bring one to Highway 38, which will rejoin Highway 93. This track is a well graded dirt road, and will lead to Skalkaho Pass. This is worth the trip, since you can spend a few moments taking in the Skalkaho Falls. All off-road vehicles operated on public land must be titled. All off-road vehicles must be registered at least once, with the owner receiving a decal to be placed on the off road vehicle. All off-road Montana drivers are required to complete an approved off-road course, and carry the Montana off-road vehicle safety certificate, while riding on public roads open to full size vehicles. In the end, it is important to know your route before departing by contacting the landowner, or land management agency, to find out about the open off-road routes.